A pretty interesting film that definitely has two distinctive halves, the first one being a typical black comedy and the second one being about uncovering a potential lie. Like Greenberg, Your Friends and Neighbors, or any other film where Ben Stiller is playing a smart, but arrogant and jealous character, this movie works because of it’s black comedy and dark, humorous tone alone. The film is about a couple that thinks they are on top of the world, doing everything right, or at least that’s what they tell themselves. Pretty quickly on, they learn that they were wrong about this, and that they can try a whole different lifestyle, just by hanging out with younger people. If the first half is about that older people vs. younger people idea, the second half is all about a documentary that one character is making, and the behind the scenes truth about the whole thing. It definitely feels like two movies in one, and maybe that’s a good thing, giving us a whole new plot line to follow in the second half, right as the first half material is starting to get a little tired. While We’re Young is another black comedy with Ben Stiller in the lead role, playing an arrogant and jealous type. We’ve seen him play this kind of character in other films before (Your Friends and Neighbors, Greenberg,) and he always knocks it out of the park. This film is no exception. The movie itself isn’t anything special, but that’s certainly no fault of Stillers. It is by the same director of Greenberg, Noah Baumbach, whose best film to date was The Squid and The Whale, a movie so dark, and yet so very funny. In that film, it was Jeff Bridges playing this sort of out for himself, willing to sacrifice others, character. 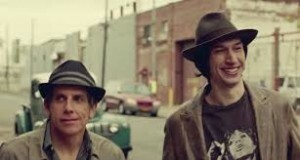 Here, in While We’re Young, it’s as if Baumbach and Stiller looked at one scene from Greenberg, (the house party scene at the end, with Stiller hanging out with and commenting on the lifestyles of some much younger teenagers,) and decided to blow it up into a feature length film. The result sometimes works, but at other times doesn’t quite seem like it has enough to say. The movie opens with Josh and Cornelia (Stiller and Naomi Watts, who plays his wife,) hanging out at the place of a friend of theirs who has just had a baby. This friend is Marina, and she and her husband, Fletcher and Josh and Cornelia’s best friends. Josh and his wife now try to entertain the baby, attempting to tell the story of The Three Little Pigs and failing horribly at it, at one point even nearly mixing it up with This Little Piggy Went To Market. When they get home, Josh and Cornelia talk about how happy they are to not have any kids of their own. They discuss being free and able to do whatever they want, whenever they want. Only they don’t. Josh mentions the idea that if they wanted to go to Paris that night, they could. Only then he starts to get realistic about it, and comments on air fare when booking a flight this late, and also taking off time from work. This is definitely funny, how the idea of freedom seems so great until you actually stop for a moment and look closely at the reality of the idea. The two of them reminisce about a trip they took to Europe, only to realize that it was eight years ago. Josh is a professor, and the next day we see him at work, giving a lecture. When it comes time to use the power point presentation he has prepared, it doesn’t work. Students apologize to him as they are leaving, once the class ends. One couple actually approaches him. This is Jamie (Adam Driver,) and Darby, (Amanda Seyfried.) Jamie tells Josh how much of a fan he is of Josh’s work and then, when Josh tells him that he’s off to meet his wife at the Chinese restaurant around the corner, Jamie comments that they were actually about to go to the same place. The two couples end up sitting down together for dinner, and it mostly turns into a compliment and question and answer session about Josh’s work. By the end of the meal, Josh wants to see these two more. They go over to Jamie and Darby’s house, and Josh is astonished by how they have decorated the place. There’s a giant record collection, a type writer, and a desk that was man-made. These two are intentionally living in the past. They are twenty years younger than Josh and Cornelia, and yet they are the ones who really avoid technology, whereas Josh and Cornelia are all about their Iphones and computers. Josh and Jamie bond over movie directing. With Cornelia, it’s a little tougher. She tries to hang out with Marina and her baby, but that only gets her dragged to a baby sing along class where the mothers get way too into the music. Cornelia goes straight from that to hanging out with Darby at a hip hop dancing class, and this is more her speed. She may be out of place in the class, and decades older than everyone else in there, but she certainly has a lot of fun. Jamie takes Josh shopping and helps Josh pick out a new hat. This guy is completely changing his style, as is his wife, to try to be younger and fit in with this much younger couple. At one point, the four of them even attend a night with a Shaman, religious and cultural experience. The man gives them strange liquids to drink which cause them to either hallucinate or vomit or both. Meanwhile, the two of them start to get further and further away from their old friends, Marina and Fletcher, and at one point even show up at the apartment of these friends to learn that they have not been invited to their house party. Now, this story might sound like it is starting to become predictable. There’s the couple who have thrown their old friends to the curb to take on these new friends, and by the end will return to their old friends and realize that they were wrong to treat them this way. Only this isn’t that kind of movie. It doesn’t go down the usual path, and instead, the second half actually becomes something very different. The second half of the movie is all about the film that Jamie is making. He wants Josh to be involved, and Josh hesitates at first, but then joins up as part of the crew. The story is very basic, and even kind of dumb. Jamie doesn’t like Social Media. He thinks it is too impersonal. Instead, he decides to go on Facebook and then seek out the first person who friends him, by finding them in person. He decides to film all of this as a documentary. That means that he and a team of about four or five go driving into the town of that person who friended him, and knock on door, hoping to catch the reuniting on camera. Only the man turns out to be in an institution. They go to the institution and meet with him, but it’s only after they are done, and sitting in a restaurant to Josh looks the guy up on the internet and realizes some pretty interesting things about him. Suddenly the simple movie about finding the guy and catching the reuniting on camera turns into something entirely different. It’s kind of like how the movie has gone from being all about the two couples to being all about Jamie’s movie. Jamie meets Josh’s father in law, who happens to be a big time author with connections, and this helps Jamie’s movie get the footing it needs to stay on the right track. Meanwhile, Josh has his own movie that he has been trying to cut together for years now, and it is not going very well. He has no funding for the project, and his editor is working for him under the assumption that money is on its way in and that he will soon be getting paid. No such luck. Josh asks for advice from his father in law, but then rejects all of it, claiming that the man is jealous of the film. He also takes a meeting with a potential sponsor and blunders the whole thing, making his movie sound way more confusing than it actually is. This is where all of that jealousy comes in with Josh and his anger towards the success that Jamie is having. Towards the end of the movie, a secret gets discovered that leads to an interesting, potentially scandalous climax. The funny part turns out to be how Josh makes such a big deal about it, whereas everyone else is willing to look past it, and let the issue go. What I like is that Josh gets angry, but it very well might be for the exact wrong reasons. I like the twist ending, but the movie itself, that Driver is making, turns out to be kind of dull and take up way too much time. This film definitely has some nice jokes sprinkled here and there, but the story line loses its footing in the second half. With that in mind, it is refreshing that the movie does try to do something different in its second half. I love the way that there are basically two movies here. The first one is all about the couples meeting and becoming friends. This is the half that is inspired by that Greenberg scene, gives the movie it’s title, and is really what the film is about. The second half goes on a tangent for a whole other storyline about Jamie’s film. Now I like that this movie doesn’t stick to the usual formula and that there is an end twist connected to the film he is making, but something doesn’t quite click. The movie is enjoyable without being great. For Baumbach, it is definitely another interesting picture, and the humor is pretty good, but its also far from The Squid and the Whale, or from anything great.